During the extravagant media week for Super Bowl 49, there was the one man show that everybody was talking about yet he barley said a word. Seahawks RB Marshawn Lynch has never really been a player for the media to drool over. 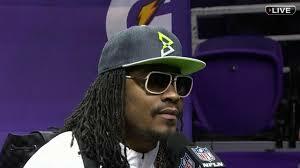 Last year during Super Bowl 48, Lynch attended media week but did not really speak. He was unfortunately fined for this as he and all players are expected to talk, answer questions, create quotes, phrases and some kind of story or angle for the national media to work with. This year he did just that without saying more than 6 words one day or more than 5 the next day. On the first media day Lynch responded to every question with the answer of “I just don`t want to get fined”, the second day was more of a follow up with “You know why I`m here”. Lynch did what the NFL wanted him to do without getting fined. He spoke but still found a loophole so he could not answer any questions, yet have everybody talk about him, and still not get fined. This did not sit well the league. The NFL executives probably felt disrespected and scurried to find another way to throw a punch at Lynch, so what does the league recommend? A $100k fine for the hat he wore during his bland but hilarious mass interviews. You see Lynch is one step ahead of the game off the field and on. The hat he wore is his Beast Mode brand which is manufactured by NFL sponsor New Era, but the logo is not. This hat within hours generated over thousands of orders, eventually selling out. Lynch has trademarked 4 different designs to his brand. Tons of orders are still coming in and everything is on back order to fulfill the demand. Yes I ordered one as well. So the genius part of this is that Lynch now has used his media coverage to cover his fines, market his brand, make profit and still find a way around the NFL`s arm twist of the right to remain silent. Lynch then surprised the nation, media and the NFL by doing a commercial that aired during media day with Progressive auto insurance, in which he spoke beautifully and with a smile. That smile said “Hey I`m getting paid a lot for this. I`m talking but it isn’t too you…bring it” pure genius. He got paid for that as well. It seems like Lynch had this planned the whole time because he saw the arm twist coming and probably is upset he had to pay $50k for scratching himself. I would expect him to march to the beat of his own drum all the way up until the end of the big game, he probably has some antics in store, those antics are probably going to lead to profits if he still remains masterful at this “screw you NFL” craft. Lynch has stood up for his rights, the right to remain silent, while he BOOMS on a big drum.